A School Banking Conference held at Cumilla organized by First Security Islami Bank Ltd. as a Lead Bank of Financial Inclusion Program in Educational Institutions through Lead Banking System under the instruction of Bangladesh Bank. The conference would let the students know about savings, creating savings mentality and growing up with a positive view of savings through school banking is the main objective of this program. Mr. Md. 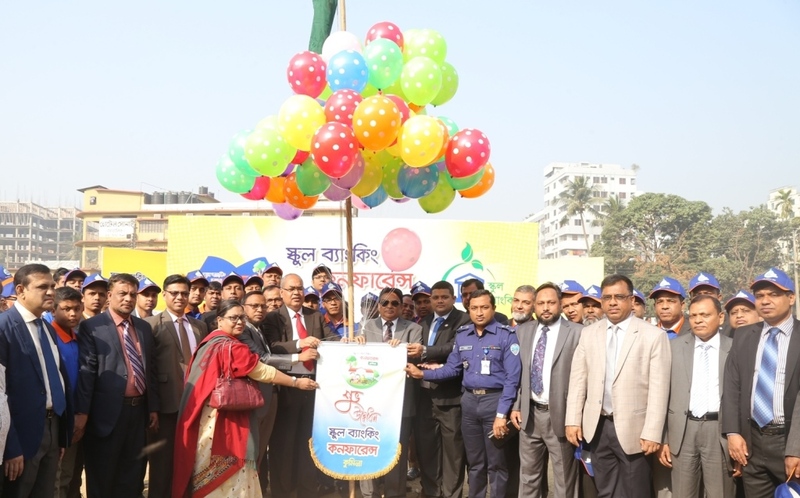 Abul Bashar, General Manager, Bangladesh Bank was present on the occasion as Chief Guest and Mr. Abdullah Al-Mamun, Additional Police Super (Administration & Finance), Cumilla presided over the program. Among others, Mr. Abdul Aziz, Additional Managing Director of First Security Islami Bank, Mr. Md. Nurul Hoque, General Manager, Sonali Bank Limited, Mrs. Parvina Akter, General Manager, Bangladesh Krishi Bank, Mr. Zahid Hossain Siddik, Additional District Magistrate, Cumilla, Mr. A. H. M. Rafiqul Islam, Joint Director, Financial Inclusion Department, Bangladesh Bank, Mr. Md. Abdul Mojid, District Education Officer, Cumilla, were present as Special Guest and representative of every branches of banks situated at Cumilla were also present on the occasion.